"Everything comes to him who hustles while he waits," Thomas Edison once said. But is hustling all it takes? Is progress always deliberate? Sometimes genius arrives not by choice—but by chance. Below are our ten favorite serendipitous innovations. Percy Spencer, an engineer at Raytheon after his WWI stint in the Navy, was known as an electronics genius. In 1945, Spencer was fiddling with a microwave-emitting magnetron—used in the guts of radar arrays—when he felt a strange sensation in his pants. A sizzling, even. Spencer paused and found that a chocolate bar in his pocket had started to melt. Figuring that the microwave radiation of the magnetron was to blame (or to credit, as it would turn out), Spencer immediately set out to realize the culinary potential at work. The end result was the microwave oven—savior of eager snackers and single dudes worldwide. In 1879, Ira Remsen and Constantin Fahlberg, at work in a laboratory at Johns Hopkins University, paused to eat. Fahlberg had neglected to wash his hands before the meal—which usually leads to a quick death for most chemists, but led to him noticing an oddly sweet flavor during his meal. Artificial sweetener! The duo published their findings together, but it was only Fahlberg's name that made it onto the (incredibly lucrative) patent, now found in pink packets at tables everywhere. That is to say, Remsen got screwed—he later remarked, "Fahlberg is a scoundrel. It nauseates me to hear my name mentioned in the same breath with him." In 1943, Navy engineer Richard James was trying to figure out how to use springs to keep the sensitive instruments aboard ships from rocking themselves to death, when he knocked one of his prototypes over. Instead of crashing to the floor, it gracefully sprang downward, and then righted itself. So pointless—so nimble—so slinky. The spring became a goofy toy of many childhoods—that is before every kid inevitably gets theirs all twisted up and ruins it. 300 million sold worldwide! 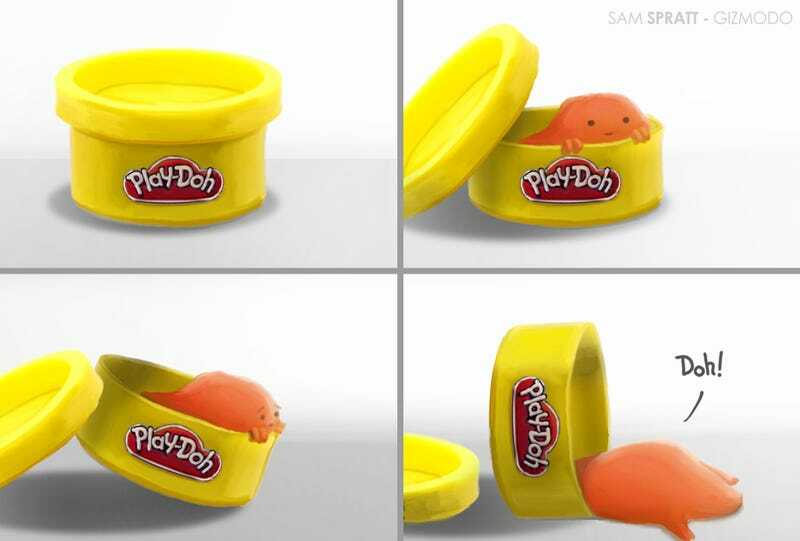 Before being found ground into the rugs of child-rearing homes everywhere, Play-Doh was ironically created to be a cleaning product. The paste was first marketed as a treatment for filthy wallpaper—before the company that produced it began to go down the tubes. The discovery that saved Kutol Products—headed for bankruptcy—wasn't that their wall cleaner worked particularly well, but that schoolchildren were beginning to use it to create Christmas ornaments as arts and crafts projects. By removing the compound's cleanser and adding colors and a fresh scent, Kutol spun their wallpaper saver into one of the most iconic toys of all time—and brought mega-success to a company headed for destruction. Sometimes, you don't even know how brilliant you are until someone notices for you. In what have been a very messy moment of discovery in 1942, Dr. Harry Coover of Eastman-Kodak Laboratories found that a substance he created—cyanoacrylate—was a miserable failure. It was not, to his dismay, at all suited for a new precision gun sight as he had hoped—it infuriatingly stuck to everything it touched. So it was forgotten. Six years later, while overseeing an experimental new design for airplane canopies, Coover found himself stuck in the same gooey mess with a familiar foe—cyanacrylate was proving useless as ever. But this time, Coover observed that the stuff formed an incredibly strong bond without needing heat. Coover and his team tinkered with sticking various objects in their lab together, and realized they had finally stumbled upon a use for the maddening goop. Coover slapped a patent on his discovery, and in 1958, a full 16 years after he first got stuck, cyanoacrylate was being sold on shelves. The next time you make a frustration-free omelette, thank chemist Roy Plunkett, who experienced immense frustration while inadvertently inventing Teflon in 1938. Plunkett had hoped to create a new variety of chlorofluorocarbons (better known as universally-despised CFCs), when he came back to check on his experiment in a refrigeration chamber. When he inspected a canister that was supposed to be full of gas, he found that it appeared to have vanished—leaving behind only a few white flakes. Plunkett was intrigued by these mysterious chemical bits, and began at once to experiment with their properties. The new substance proved to be a fantastic lubricant with an extremely high melting point—perfect at first for military gear, and now the stuff found finely applied across your non-stick cookware. In 1907, shellac was commonly used to insulate the innards of early electronics—think radios and telephones. This was fine, aside from the fact that shellac is made from Asian beetle poop, and not exactly the cheapest or easiest way to insulate a wire. What Belgian chemist Leo Baekeland found in instead was—get ready—polyoxybenzylmethylenglycolanhydride, the world's first synthetic plastic, commonly known as Bakelite. This pioneering plastic was moldable into virtually any shape, in any color, and could hold its form against high temperatures and daily wear—making it a star among manufacturers, jewelers, and industrial designers. An assistant professor at the University of Buffalo thought he had ruined his project. Instead of picking a 10,000-ohm resistor out of a box to use on a heart-recording prototype, Wilson Greatbatch took the 1-megaohm variety. The resulting circuit produced a signal that sounded for 1.8 milliseconds, and then paused for a second—a dead ringer for the human heart. Greatbatch realized the precise current could regulate a pulse, overriding the imperfect heartbeat of the ill. Before this point, pacemakers were television-sized, cumbersome things that were temporarily attached to patients from the outside. But now the effect could be achieved with a small circuit, perfect to tuck into someone's chest. Alright, that's something of an exaggeration, but a dog did play an instrumental role. Swiss engineer George de Mestral was out for a hunting trip with his pooch, and noticed the annoying tendency of burrs to stick to its fur (and his socks). Later, looking under a microscope, Mestral observed the tiny "hooks" that stuck burrs to fabrics and furs. Mestral experimented for years with a variety of textiles before arriving at the newly invented nylon—though it wasn't until two decades later that NASA's fondness for velcro popularized the tech. Okay, yes, x-rays are a phenomenon of the natural world, and thus can't be created. But sshhh! The story of their discovery is a fascinating one of incredible chance. In 1895, German physicist Wilhelm Roentgen was performing a routine experiment involving cathode rays, when he noticed that a piece of fluorescent cardboard was lighting up from across the room. A thick screen had been placed between his cathode emitter and the radiated cardboard, proving that particles of light were passing through solid objects. Amazed, Roentgen quickly found that brilliant images could be produced with this incredible radiation—the first of their kind being a skeletal image of his wife's hand.